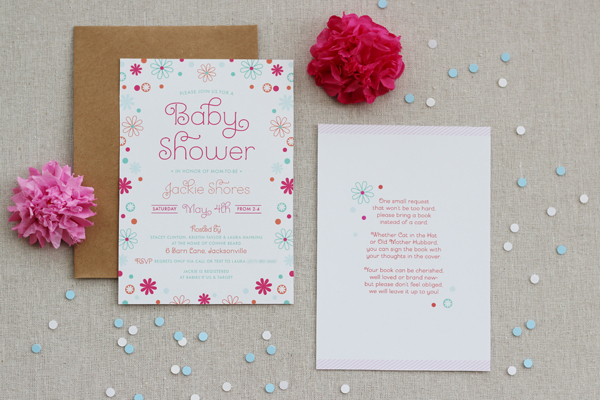 Today’s post features a very special shower invite that I worked on recently. The baby shower was given in honor of my cousin Jackie, who is expecting her baby girl any day now. Her two sisters and myself hosted the bright and cheerful event at my parents’ house. Jackie and I grew up together and were pretty much inseparable as kids. We are only six months apart in age, and now her baby girl will be six months younger than my Caroline- how cool is that? I only wish we lived closer so they could spend endless hours playing together and getting into trouble like we did! 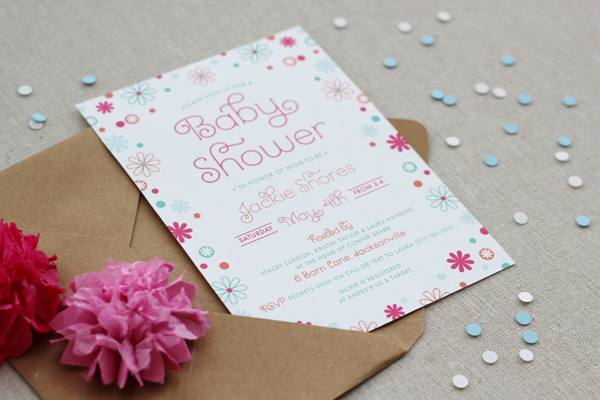 The shower invitations were digitally printed on smooth, 110# white uncoated cover. 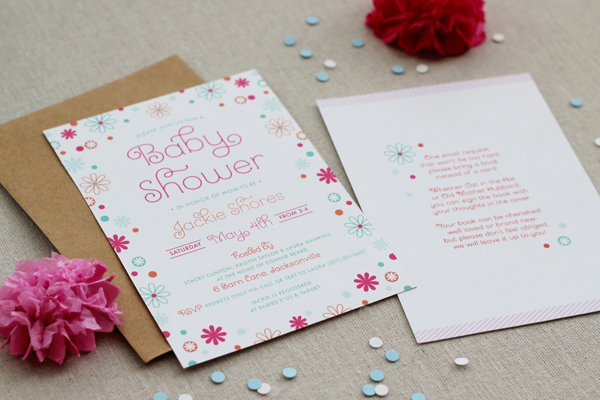 The design for the invitations was inspired by the fabrics Jackie had chosen for the nursery, featuring lots of bright cheerful colors and some fun floral patterns. I played up the pinks and blues in particular, along with a touch of coral. 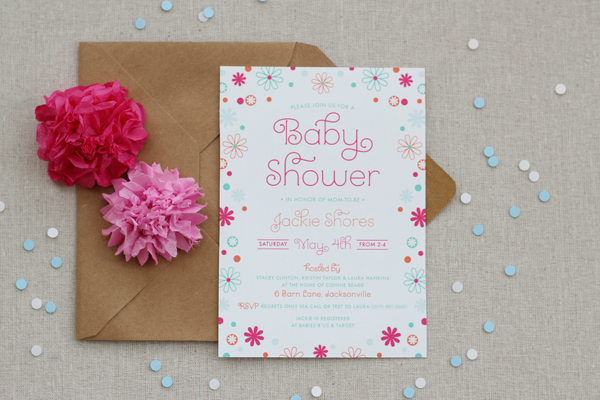 The body of the invitation features a sweet and curly font, with a festive frame of flowers and confetti. On the back of was a little poem we found on pinterest asking guests to bring a book instead of a card. They received so many great books, and gifts, for that matter- everything is perfectly set to welcome the little Miss into the world! Today I’m introducing the last of my new wedding invitation suites for Minted: Marquee. This design was inspired by vintage theater posters, and I’m so happy with how it turned out. I especially love the RSVP card, and of course the patterns on the envelope liners and the backers. Patterns are my favorite thing to work on with any design- I love figuring the scale, illustration and type of repeat to use to really tie everything together. Marquee and the rest of my wedding invitations are available for purchase via my Minted storefront. Be sure to check back in later this week, I have a stack of recent custom projects that I’m excited to share! Goodmorning, hope you had a lovely 4th yesterday! Today I’m introducing the second of my most recent designs for Minted’s wedding invitation line: Baby’s Breath. Baby’s Breath (aka Gypsophila) on its own can be quite lovely, with its cloud-like fluffiness. 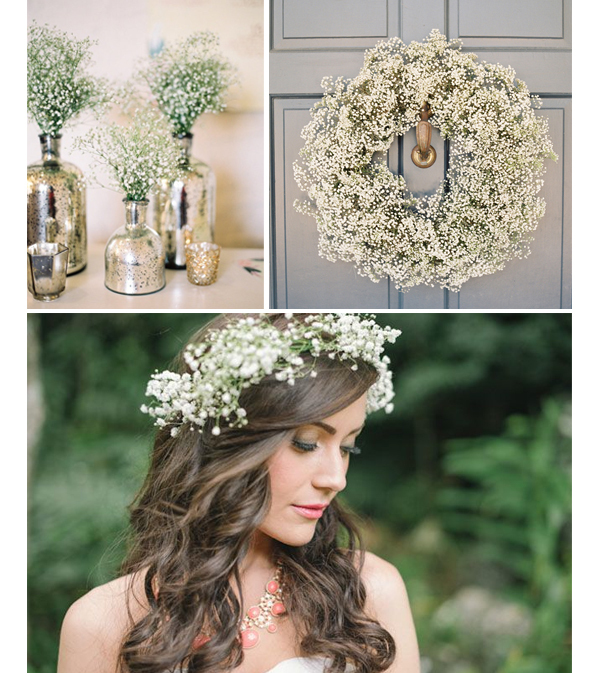 I wanted this suite to capture that dreamy quality of Baby’s Breath, as well as its subtle nature. To see more beautiful images of Baby’s Breath in action, check out this Pinterest Board that I put together. The Baby’s Breath invitation suite and the rest of my wedding invitations for Minted are available for purchase in my storefront. My favorite parts of this suite are all of the slightly mismatched patterns. In designing the various pieces I wanted the overall look to be sweet and dainty, like the contents of a linen drawer in an old farmhouse. Country Classic and the rest of my invitation suites can be found in my Minted shop. Check back later this week and early next week for posts on my other two new invitation designs!